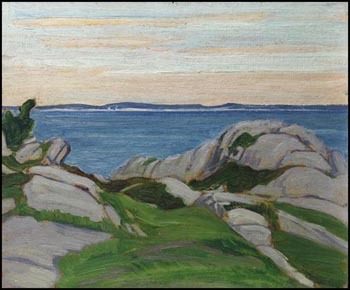 In July of 1922, after his first full year teaching at the Ontario College of Art, Group of Seven member J.E.H. MacDonald traveled to Petite Rivière in Nova Scotia to visit his life-long artist friend Lewis Smith, staying for a month. Seeing the ocean revived fond memories of his youth in England watching ships on the river at Newcastle, and he did considerable oil sketching of shore and harbour subjects. In a letter to his wife, MacDonald enthused, “The waves have been magnificent the last few days, such a thundering crash and roll - the rattle of pebbles in the backwash of the waves. And the whole place is so solitary, like Crusoe’s coast, so that you almost resent a footprint in the sand.” After the intensity of his work in Algoma, the Nova Scotia works were more serene, such as this stunning, contemplative painting with its cool tones of turquoise, azure and rich green. The collection of the National Gallery of Canada, Ottawa, includes a 1923 canvas produced from this trip entitled Seashore, Nova Scotia, as well as the 1922 oil sketch entitled Bridge at Petite Rivière, Nova Scotia.